No one has precise information about the origin of the olives, history of the olive and the olive tree. No exact date, which could to operate. Archaeologists, paleo-botanists conducted studies in the Mediterranean region, and discovered different kinds of wild olives. 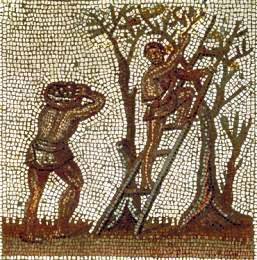 The olive was considered sacred by many in the old world. Olive branches were found in the tomb of the Egyptian pharaoh, Tutankhamen (1341 BC - 1323 BC). The leaves were used to crown victors of both war and athletic competitions and as offerings to deities. The oil was used at coronations to anoint kings and lamps ancient temples burned olive oil. Thus the olive as tree, fruit, and oil is an integral part of the ancient history of the Mediterranean and parts of the Middle East. For the first time olives began to use in agriculture the eastern Mediterranean and within the borders of Syria. According to information, Syria began to use olives in agriculture in 6000 B.C. The use of olives in agriculture and its spread throughout the world begins from Syria. Found the prototypes of olive trees in Hatay, Kahramanmaraş and Mardin, proves his place of distribution. The first phase began with the olive spread south-eastern part of the Anatolian region, then the islands of the Aegean Sea through the western Anatolia, then through Greece to Italy, France and Spain. Through Italy go to Sicily, and only then in the northern part of Africa. The second phase of the spread of olives, passed through Syria and Egypt are associated with the Mediterranean coast came to dominate the whole of geography. The third stage took place over Iran and Iraq and has spread to Afghanistan and Pakistan. Distribution of the olives around the world was completed in North and South America, which brought the Spaniards in the 16 century. According to another view olives spread from the wild olive, "Olea Chrysophylla", whose height ranges from 2 to 15 meters. Branches of the trees do not break and are permanently green. This type of olive spread from South Africa to Central Africa, and from there to Egypt and the Middle East through India and Pakistan to China. In Greece was found that in 1500 B.C olives used in the trade. The tomb of Tutankhamen was discovered olive oil, which refers to 1325 B.C. According to historical data, olive oil was used not only in food but also for medical purposes, as fuel and used in religious rituals. In Europe the Romans brought the olives and spread the culture of consumption olive. Cretans have played active role in spreading the culture of olives in Europe and world. 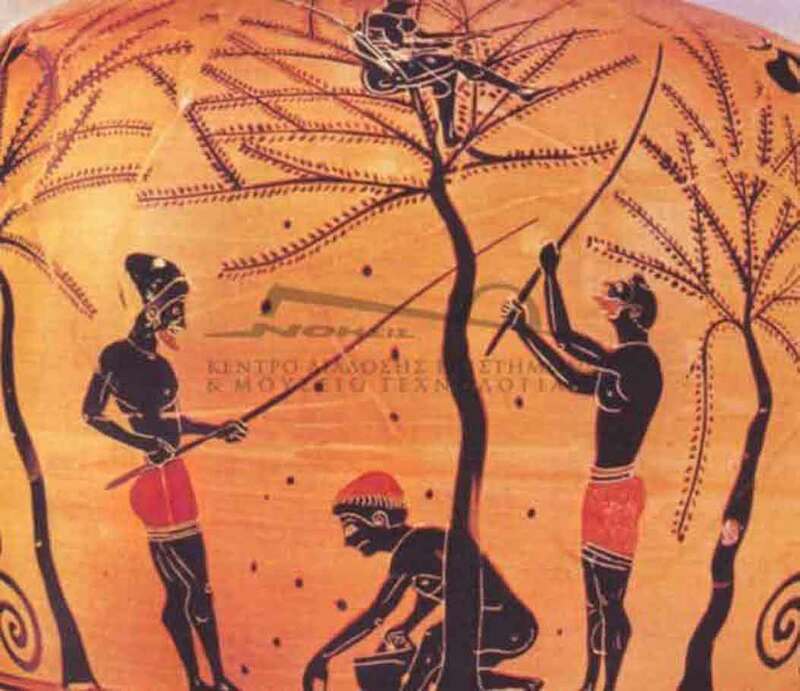 Cretans were the first who developed the trade of olives, and about 3000 years dominated the market. This view is supported by the data that have been found in Europe, on the ruins of the palaces of Knossos and Faistos capital of Minos were found jars of olive oil with height of 2 meters. At the present time, there were unearthed these findings, where is produce olive oil. In 3000 B.C in the Crete, a stone mortar used for olives and making oil, then it is a primitive instrument was replaced by a stone cylinder and began its wide circulation in 1700 B.C. 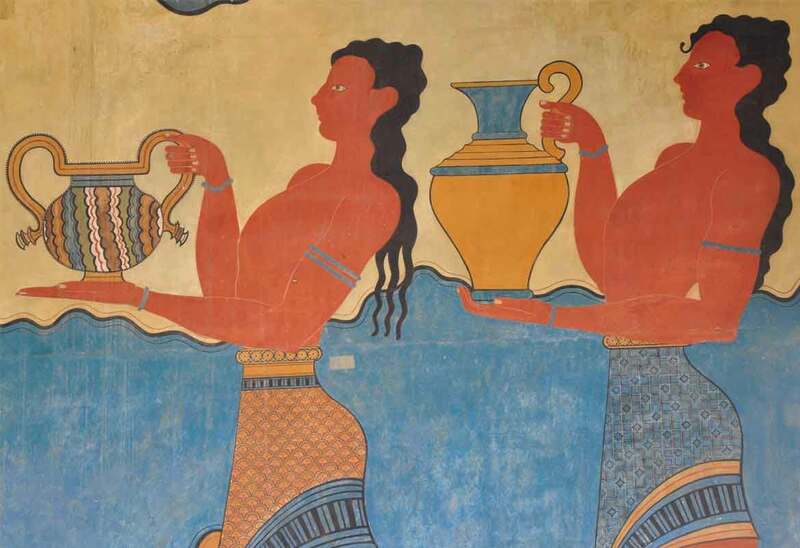 In the Crete in the palace of King Minos of Knossos were discovered on the walls of small drawings of people dancing, and located between the northern entrance of a relief depicting an olive tree and the sacred bull. Also there were found numerous two-meter high giant jugs (Pithoi) and the place where you can store 75 - 100 tons of oil. 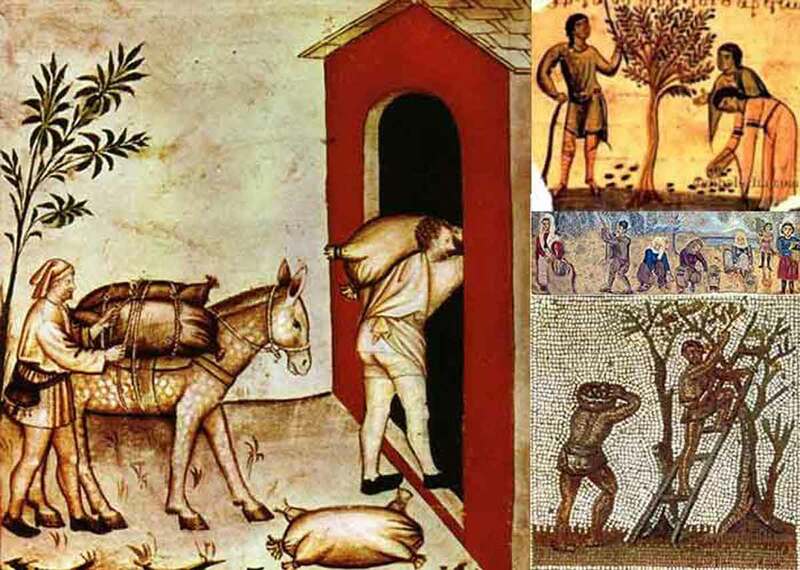 Residents Minos large quantities of exported oil, olive trees and seedlings were sent to Africa and Greece. The fact that the Cretans consume and sell olive oil amphorae found proved which show the olive branch, the star-shaped characters, symbolizing the olive tree. When the time Adam Seth came asks God to forgive all the people and goes to heaven. Once in paradise Seth meets angel heavens, she gave him the tree seeds, and says that when your father dies put in his mouth the 3 seeds and so buries him. Seth’s father died and he did as said the Angel. After some times at the grave grew three trees. One of them was the cypress, cedar and olive trees. The first life olive tree starts during the Flood, when the pigeon returned on the ship with a sprig of olive tree. From the perspective of the three divine religions, Jesus Christ rose to heaven from Mount Olive and there are olive trees. Jews believe that the olive tree is descended and it was here. According to Islam the bridge Sirat Haram al-Sharif was built between of Olive Mountain. According to Christianity, the prophecy of Jesus was at Olive Mountain and rose to heaven from here. In ancient Egypt, olive oil has been used to clean. In the tombs of pharaohs put the banks of olive oil. Jews have their agreements covered with olive oil, the Romans to cover the altar where it was stored the holy bread, put the requirement to use olive oil. Wisdom, strength and power of kings show up with olive oil, she rubbed her head for kings, this tradition continues today in Europe during the coronation.